Total precast frames ... supplied for apartments. Qanbar Dywidag Precast Concrete Company continues to be associated with some of the big players in the industry, thanks to the reputation it has built since its inception 34 years ago. Qanbar Dywidag Precast Concrete Company’s (QDC) project footprint and reputation continues grow with major customers calling upon the leading Saudi precast concrete manufacturer to undertake repeat orders. Among its latest contracts is work for Saudi Aramco’s Dhahran residential community, packages Four, Five and Seven. QDC is supplying complete wall frame systems for the housing project under subcontracts from the contractors on the packages, namely China Railway Construction Corporation, Arabtec and Khonaini, respectively. Package Four involves 240 housing units, Package Five, 380 units while Package Seven comprises 13 buildings including family apartments and bachelor accommodation buildings. The company is also involved in Saudi Aramco’s residential project at Ras Tanura, supplying wall frame systems for 80 villas to the contractor Khonaini, according to Mohammed Abdullah, QDC sales manager. Other Saudi Aramco projects in which QDC is engaged include a unique development in Thuwal (Northern Province) under a contract valued at SR300 million ($80 million); and a project in Rabigh, which has Saudi Arabian Baytur Construction Company as contractor. In addition to Saudi Aramco, other big names amongst QDC’s clientele are the Royal Commission of Jubail and Yanbu, Saudi Basic Industries Corporation (Sabic), Saudi Electricity Company (SEC), Ma’aden and various military and civil government authorities as well as the private sector. 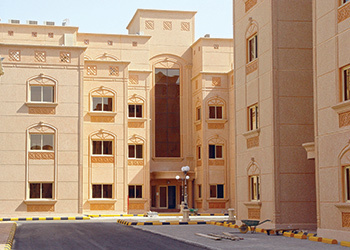 For the Royal Commission, QDC is currently involved in two housing projects in Jubail, where it is supplying total precast frames and cladding for family apartments (C16), and full-frame precast components for housing units (C-71) on the project where Azmeel Contracting is the contractor. “In fact, the Royal Commission has even approached QDC to handle delayed projects it had awarded to other precast companies to meet its target schedule as rush projects,” says Abdullah. “The project is the National Guard family compound, which consists of 500 villas being carried out by Azmeel Contracting Company,” he adds. 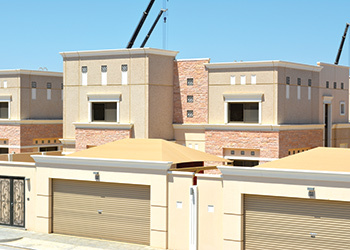 With reliability and quality as its hallmarks, the veteran precast concrete specialist remains the leading supplier for several housing, industrial and infrastructural projects under way in the kingdom. QDC designs, manufactures, delivers and installs architectural and structural precast, prestressed concrete products for commercial, residential, industrial and government projects throughout Saudi Arabia. The company has also supplied precast components to a number of contractors working on Sadara Chemical Company’s integrated chemical facilities in Jubail, which calls for providing pipe racks, precast cladding, and full-frame precast components, says Abdullah. Other commercial and industrial projects it is supplying to include precast cladding for Madinah Hotel, which has International Building Systems as the contractor; Saudia facilities in Jeddah (Specialised Contracting Company); blast-resistant substations at Jizan Refinery (Daewoo Company); a boundary wall for Marafiq in Yanbu (Azmeel Contracting Company); and hollowcore slabs for a car-park at Jeddah Islamic Port (Project Build Company). It is also providing precast components for the construction of Ali Reza Centre in Jeddah (Jawdat Company); Makkah Al Mukarama Complex - Phase Three in the Muzdalifa area, having completed Phases One and Two of the project in record time (Al Fawzan Trading and Contracting Company). QDC caters to the huge demand for residential compounds. In addition, QDC is also involved in the infrastructure and utilities sector supplying to projects such as the Haramain High-Speed Railway in the Western Area (Inabensa Company); and a water transmission project for Saline Water Conversion Corporation in the Western Province (Sinopec). The company now expects to get a good share of work in the Waad Al Shammal Industrial City Development and Saudi Aramco housing projects in Dhahran and Jubail areas. QDC was established in 1981 as a partnership between Al Ansari Holding Company (Abdul Razzaq Mohammed Qanbar Al Ansari and Sons), a leading business conglomerate in the Eastern Province; and Dycherhoff and Widmann (Dywidag), one of the largest German general contractors and precast concrete manufacturers. In January 2002, Al Ansari Holding became the sole owner of QDC with Dywidag remaining as a technical partner. Its products are manufactured in modern three factories, located in Jubail and Rabigh, which have a combined production capacity of more than 5 million sq m per year (2 million sq m at its Jubail factories and 3 million sq m in the Rabigh factory). These facilities are regularly upgraded and expanded to ensure they are able to meet the growing demand as well as add value to the company’s products. QDC has already installed a highly-automated state-of-the-art concrete batching plant at its main factory in Jubail, and four additional hollowcore lines at its Rabigh factory. It is also set to launch the construction of a new administration building, mess hall and mosque, at the Rabigh factory. Abdullah says the company has recorded a significant increase in the volume of work over the past year and sees bright prospects ahead in terms of business, given the huge demand for its products that are helping speed up housing projects in the Eastern, Central, Western and Northern provinces. To cater to the increased demand in the market, the company recently opened a new sales office in Jeddah and will be expanding its sales staff in Jeddah, as well as in Riyadh, Jubail and Dammam. QDC is also a joint venture partner in Qatar International Precast (QIP) in Doha, Qatar, producing a full line of precast and pre-stressed concrete products for the country’s rapidly expanding building construction and infrastructure market in anticipation of the 2022 Fifa World Cup.